Dianne Grod hooked her arms over the fence and called out, “Papa, Papa!” The big chestnut horse at the top of the hill lifted his head. “Then he came running full tilt to me. I thought he was going to jump out; he went absolutely berserk when he heard me,” Grod said. She hadn’t seen The Godfather in more than five years, but the Thoroughbred remembered her. They’d both been through quite a bit in the time they were separated, but their bond, formed over many, many grand prix courses, remained. 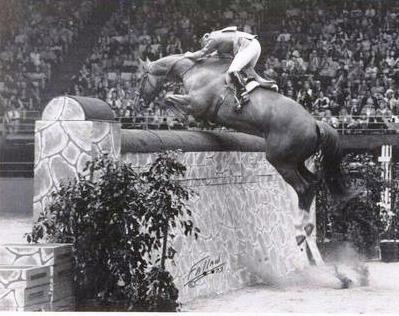 Even carrying an enormous amount of lead weight along with Dianne Grod, The Godfather made the biggest jumps look easy. “You couldn’t draw a better type for a grand prix horse,” Dianne Grod said of The Godfather’s conformation. It was in early 1972 that Grod first found The Godfather. 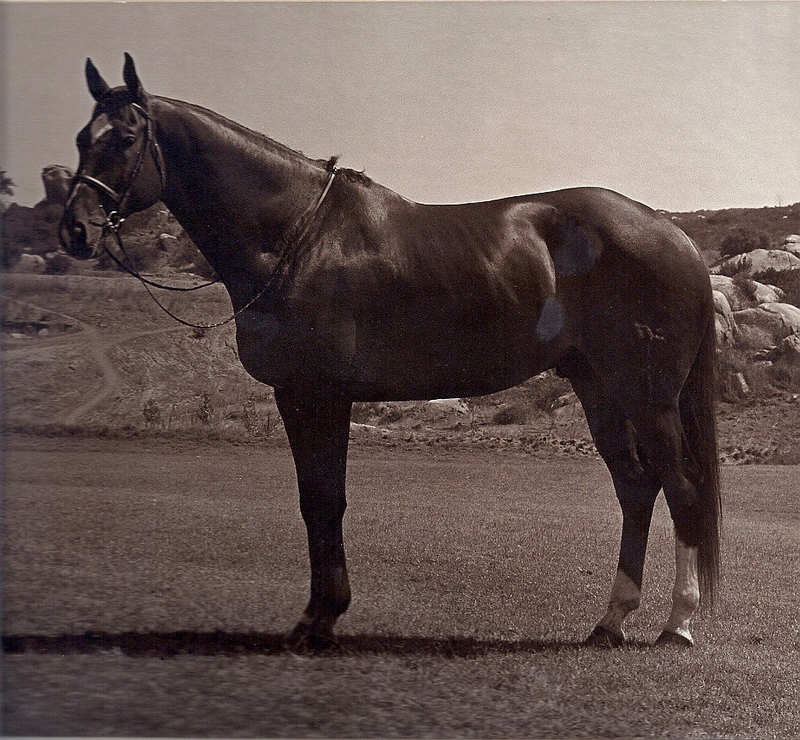 Patty Jenkins, then Rodney Jenkins’ wife, had called Grod and told her about the leggy gelding. “She said, ‘I have the most amazing horse, and Rodney hates him.’ The Godfather was a really bad shipper. Rodney knew the horse was fabulous, but several times he’d try to haul him to horse shows, and he’d destroy the trailer,” Grod recalled. “He never got to show him. He hauled him all the way to Florida and couldn’t show him. Patty was keeping him at another farm because Rodney said, ‘Just get him out of here.’ She told me I had to go try him.” Ira Schulman had gotten The Godfather (not his Jockey Club registered name, which has gotten lost) off the track, and he’d gone through Wilson Dennehy and Bernie Traurig’s barns before landing with Jenkins. 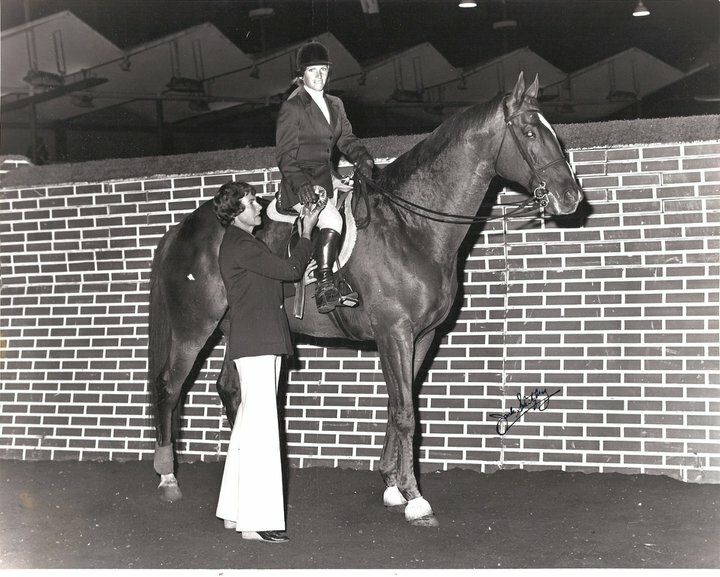 Even though at 4’9″ Grod looked tiny on the 17.1-hand “Papa,” she fell in love with him right away and bought him, sending a horse van lined with mattresses from California to Virginia to pick him up. When he arrived on the West Coast, a client of Grod’s bought him for Grod to show. “He was practically unbeatable. He was an amazing horse. He was allergic to rails. We didn’t even really have to train him; he just was so good. He and I really hit it off,” she said. Papa found another kindred soul in Grod’s groom, Lynn Earl Gola McClanahan. The Godfather was an absolute favorite of groom Lynn Earl Gola McClanahan. For the first year, the only way Papa could travel to shows was if McClanahan rode with him. “Whether I was tired or not I had to stand there with him. There was no sitting down and catching a snooze on the way home from a show,” McClanahan said. Then, she and Grod figured out the key to Papa’s travel. They loaded him into a double stall of the van backward, with his head tied to the peak of the van and his hind end in the aisle. “He rode like a champ once we figured out his trick,” McClanahan said. Grod and Papa turned into a top grand prix pair on the West Coast, and in the mid-’70s, they traveled east, tying for 10th in the American Gold Cup and placing fourth in the American Invitational. 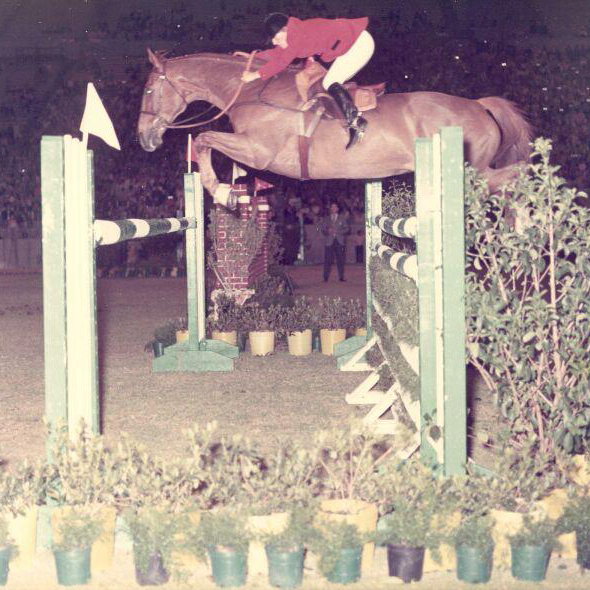 In 1977, they represented the United States at the first Nations Cup competition held at Spruce Meadows. 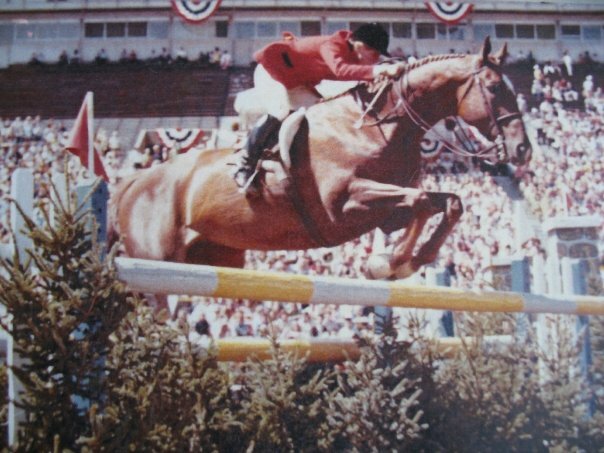 After winning up and down the West Coast, Dianne Grod and The Godfather came east and placed in the American Invitational and the American Gold Cup. “He had the perfect shoulder, the perfect hip. He was just one of those horses that standing you couldn’t draw a better type for a grand prix horse,” Grod said. “He was totally brave. I don’t think he ever said no to me. His jump was like an out-of-body experience. I spent half the time just trying to stay on him. “In those days, women had to carry weight, 154 pounds. I was 4’9″, and I carried like 55 pounds of lead on him. Ninety percent of the winning he did, he did carrying an ungodly amount of lead,” Grod recalled. The Godfather stood a massive 17.1 hands, and Dianne Grod was just 4’9″. 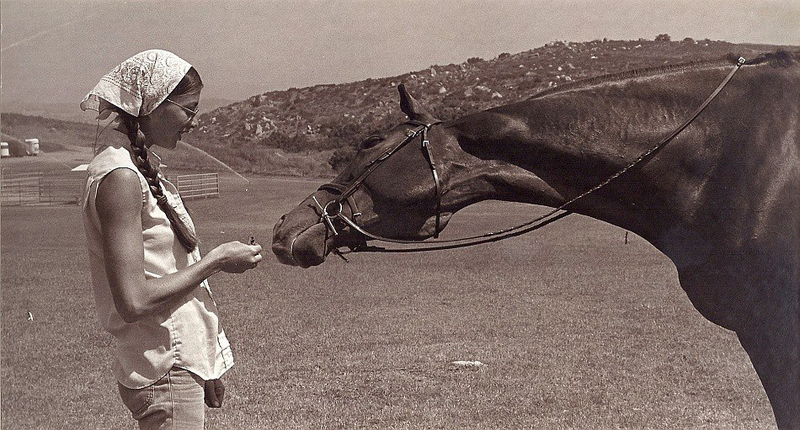 But by the end of 1977, Grod’s relationship with Papa’s owner had deteriorated, and the owner sent the horse to Linda Allen’s barn, where he continued to show. After a few years, Papa’s show career dwindled, and Grod heard that he had returned to the track. She always kept an ear out for Papa’s whereabouts. “I heard that they had him at the racetrack ponying horses. But I lost track of him eventually. I put the word out to find the horse. I called everyone in California. He was pretty distinctive looking, so you’d recognize him,” she said. Then one day in the early ‘80s, Grod got a call from Rudy Leone. A woman in Northern California has contacted him saying she had rescued a horse with incredible jumping talent. Apparently, Papa’s owner had passed away, and a relative had inherited him and put him in a field but wasn’t feeding him well. A woman running a boarding barn had been feeding him hay whenever she drove by, and eventually she was given the horse. This was part of a 2013 series of Classic Thoroughbred Show Horses articles on COTH. CLICK to read them all!